As hurricane Fabio in the Pacific Ocean makes its way to the Bay Area coastline, San Mateo County emergency officials warn beachgoers about its on again, off again nature. Meanwhile, a fishing boat has been stranded on a beach in Pacifica for almost a week. Robert Handa reports. A fishing boat has been stranded on a beach in Pacifica for almost a week as crews worked frantically to get the boat back in the water Friday. Edward Gonzalves of Oakley set out on his boat the “Trophy” to so some salmon fishing when big waves sent the boat onto shore. 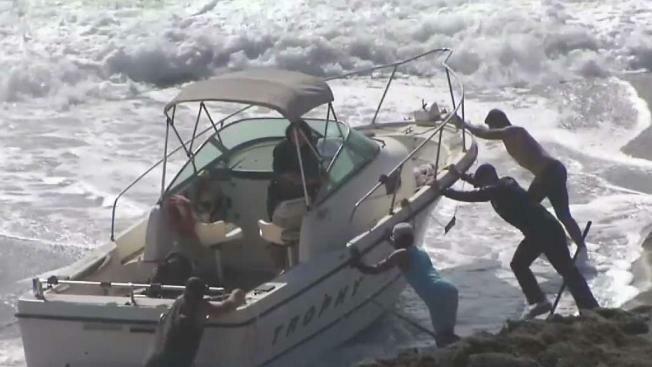 "The wave came into the boat, distributor went, and the boat stalled, pushed the boat onto the shore," said Gonzalves. This comes as hurricane Fabio in the Pacific Ocean makes its way to the Bay Area coastline, San Mateo County emergency officials warn beachgoers about its on again, off again nature. "Waves will come at uneven intervals, so you might not see a wave for 15 to 20 minutes and then all of a sudden you’ll see a group of them," said Cary Smith, Deputy Harbormaster, "and that can kind of lure people into thinking it’s a calm day when it might not be." The waves would be surging at times along the San Mateo County coast, then gradually subside before rising again thanks to the effect of Hurricane Fabio which will hit southwest-facing beaches along the pacific coast. Beach conditions have prompted officials to issue a Beach Hazard Statement in Marin, San Francisco, San Mateo and Sonoma until 3 p.m. Saturday. The hazards may include sneaker waves, strong rip currents and long shore currents, all of which could be life threatening, according to officials. Fabio started from about 935 miles off Baja California, creating big waves in Southern California as well as large swells from Sonoma to Monterey, something surfers consider good news. "Today, if it’s going to bring in eight-plus waves, I’m happy to give it a shot," said surfer Taylor Haisch. However, Pillar Point Harbor Patrol is issuing a public warning for those who want to get closer to the waves, warning them not to get fooled by calm waters disguised as rip tides or currents and so-called "sneaker" waves. "I’ll always keep my eye on the horizon, see what’s coming in and if it gets too heavy, I’ll just catch something on in and wrap it up for the day," said Haisch.